Heat index, also known as the apparent temperature, is an index that combines air temperature and relative humidity in an attempt to measure how hot it feels out. Humans perspire or sweat in order to cool their body temperature. As sweat evaporates it pulls heat away from the body. The ease in which sweat can evaporate is dependent on the temperature and humidity of the surrounding air, therefore as humidity increases our ability to cool ourselves by sweating decreases and we feel hotter. Heat index is calculated based on temperatures in the shade, therefore it can feel hotter than the heat index when in direct sun by up to 15°F. 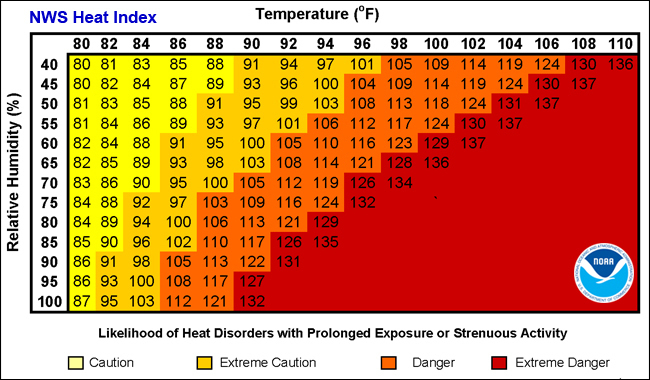 The NOAA chart below shows the heat index values for a given temperature and relative humidity.